I still had one more skein of the Elann Peruvian Highland Wool, even after the slew of hats and a pair of mittens. My original calculations had the mittens requiring 160 yards. They took 60. Oops. So I set about making a one-skein hat. I cast on 96 stitches, knit some 2×2 ribbing until I got tired of it, and then made 24 increases in preparation for the cable pattern. I knit alternating panels of the XOXO cable pattern until the hat measured around 5 inches deep, and then started the decreases for the crown. I mostly winged the crown decreases, ripping once after I decided it was ugly and starting over. I’ve unvented this combination cable-cross/decrease move that helps maintain some cable-y goodness as you start to the narrow the panels. The remaining yarn went into the pom-pom. 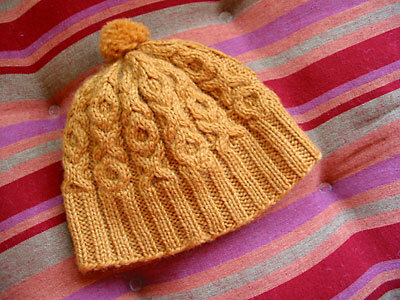 The finished hat is about 16″ around. I rather like the finished product. If I had to do it again, I’d do a couple fewer rows of ribbing at the bottom so I could finish the second repeat of the cable pattern before starting the crown decreases. I think that proportion would look a little nicer as well. Now that that’s done, time to revisit that lace! CogKnition posted this on April 22nd, 2007 @ 12:25pm in Baby Items, Finished Objects, Hats & Mittens, Knitting for Charity | Permalink to "One More for the Road"
Oh, that is so cute! The decreases look perfect! I love it! I agree with Lobstah — the decreases look fantastic!